Roland Jupiter-8 synthesizer (JP-8) and MC-4 sequencer, with OP-8 interface and MTR-100 digital cassette recorder, from inside front cover of Keyboard magazine December 1982. I quite enjoy this 'Special Product Report' advertisement - a two-page spread that kept the yellow and black design that Roland was using at the time for many ads including the TR808 (to be posted in the near future). The ad also includes some great quotes and references to famous users, including producer Martin Rushent, Devo's Mark Mothersbaugh, and Toto's Steve Porcaro and David Paitch ("... a happening polyphonic synthesizer..."). If you can't afford (or find) the real thing, many say the VST version made by Arturia is a good replacement. The MC-4, OP-8, and MTR-100 each have their own Wikipedia page, and you can also find MC-4 command flowcharts online (via Matrixsynth). 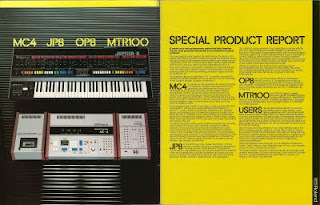 Another 1981 JP-8 ad was posted on April 2, 2009, and the MC-4 was featured in a 1978 'family photo' ad posted on March 9, 2009. End note: The JP-8 the *only* synthesizer I've ever regretted selling. Seriously. Gorgeous.....after all these years it's still the most beautiful synth ever made....imho....thanks for uploading these!